I am the great nephew of James Crozier. I had never really heard of James until about 5 years ago. Actually, not until the book, Forgotten Solders, Irishmen Shot at Dawn was brought to my attention. 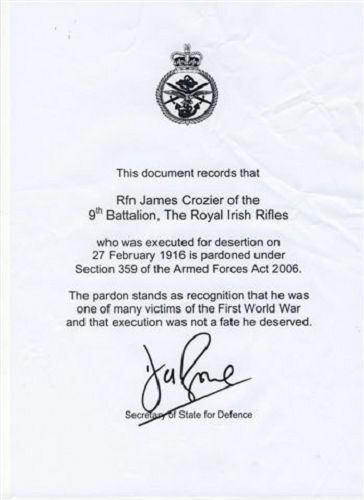 My father recently passed away but before his death, as the oldest mail relative of James, my Dad received the letter of pardon. It meant a great deal to him, his sisters and the rest of our family. I recently had the honor of traveling to the Somme, I visited the cellar were James was reported held and found and paid my respects at his grave. And by the way, he was not underage. yes, it is true that “Posthumous pardons are about rebuilding a person’s legacy.” But just as important – and maybe even more important! – it is about authorities recognizing a wrong and, in some respect at least, taking some ownership of that. Of course a wrong done cannot usually be undone, and certainly not a wrong such as this! But at least there is recognition, and perhaps – just maybe – there will be fewer such wrongs committed in the future, at least in the near future, from the time of that recognition. I am working on a sympathetic audio visual on the fate of James Crozier following a visit to the Somme and the National Arboretum at Arlewas. For a complete picture I have tried to find a photograph of James but without success. I am prepared to forward a copy of the AV to anybody interested or can supply a photograph. Found the original story while searching family name Crozier. I remember how it bothered me for some time after reading such a tragic story. I’m glad to see he was eventually pardoned. It is does help set things right. Poor guy. Posthumous pardons are about rebuilding a person’s legacy. It’s for that person’s friends and family. That’s why Pvt. Slovik’s wife has lobbied 7 presidents to pardon him. The thing about this story is the brutality with which it was carried out. It’s simply unbelievable what people can be capable of.